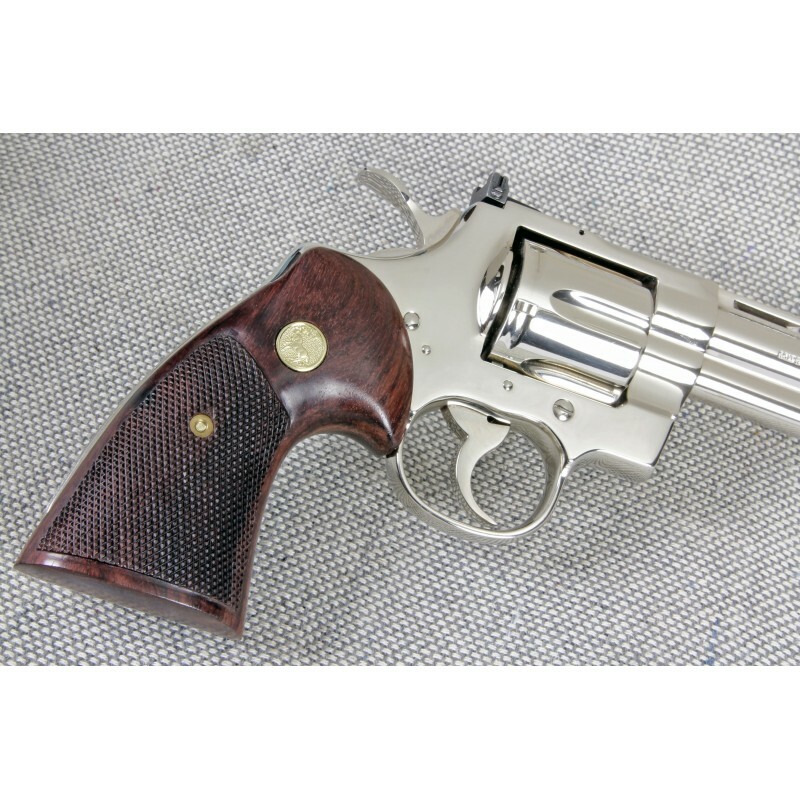 Colt Python "Third Type" Rosewood Heritage Checkered Grips w/Reclaimed Medallions. Used from early 1970's to the early 1990's. These grips are as close to the originals as can be created today. Our engravers have perfected the original checkering design in handsome rosewood. Extremely limited in supply! This item is on Backorder and will take up to 2-3 months to be in stock. For other options please call (800) 323-6144. 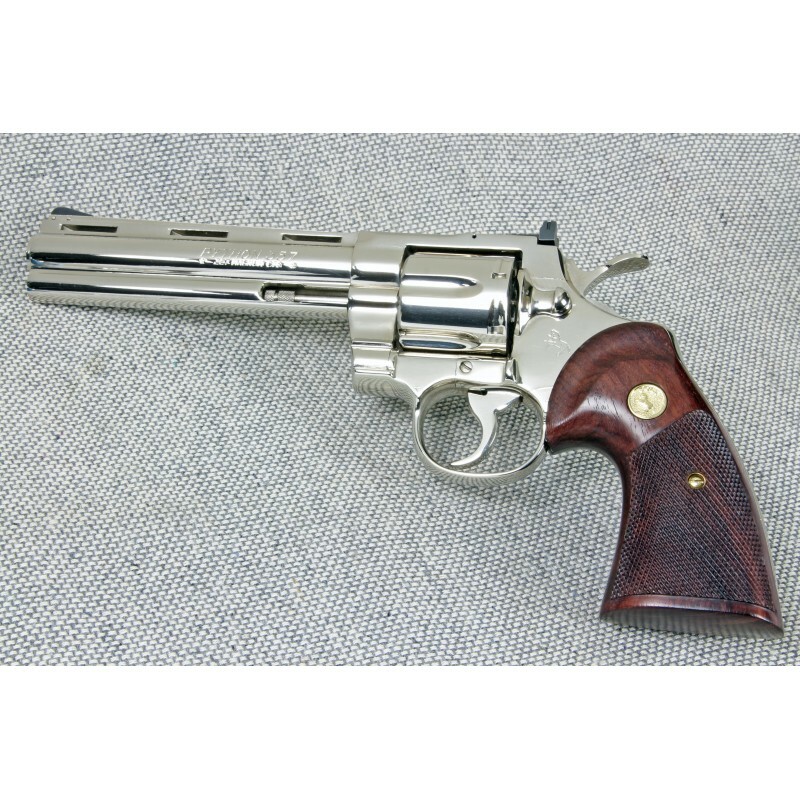 Colt Python "Third Type" Rosewood Heritage Checkered Grips w/Reclaimed Medallions. Used from early 1970's to the early 1990's. These grips are as close to the originals as can be created today. Our engravers have perfected the original checkering design in handsome rosewood. We use beautiful original Colt medallions, salvaged from old original grips, installed in the original location. Needless to say, these grips are extremely limited in their availability. After waiting many years to finally purchase my "dream gun", I was left a bit unsatisfied because it came with the original factory rubber grips. Since my dream was to have a Python with traditional wooden grips, I began my quest to replace the original rubber grips with much research and high expectations. My dream was finally fulfilled by Eagle Grips. I purchased their 3rd generation Colt Python grips with reclaimed medallions. The delivery was shorter than claimed on the web site and the quality was "second to none". I would recommend these grips and this company for those who have high expectations regarding service and product quality. Thank you Eagle Grips! Gorgeous, beautiful, just like the picture. Fits perfectly, looks fabulous, done perfectly. I would like to thank the people of Eaglegrip for their help, understanding and human approach to the client and the problem. Thanks to them, my revolver looks great. Thanks a lot. 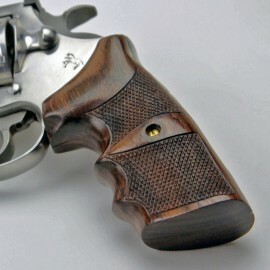 TOP quality grip ( walnut checkered heritage ) for my Colt Python !! only comment on the delivery: if they don't reply on email, just wait / don't disturb them while producing a perfect product :-) . 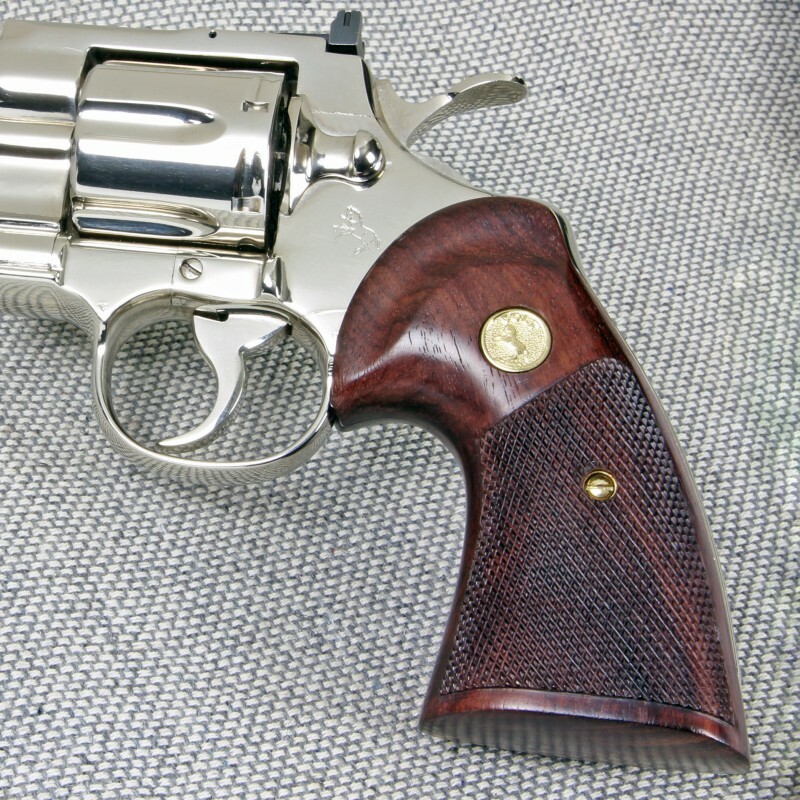 I had acquired a colt python that no long had original grips . Bought the Eagle grips and now it looks near perfect, as it originally did. 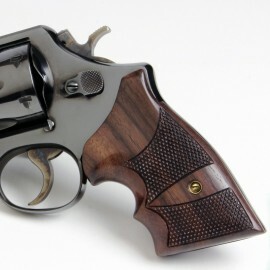 The original factory grips on my Colt Python had seen hard use from the previous owner. I have been looking for a set of late 70's grips to replace them. 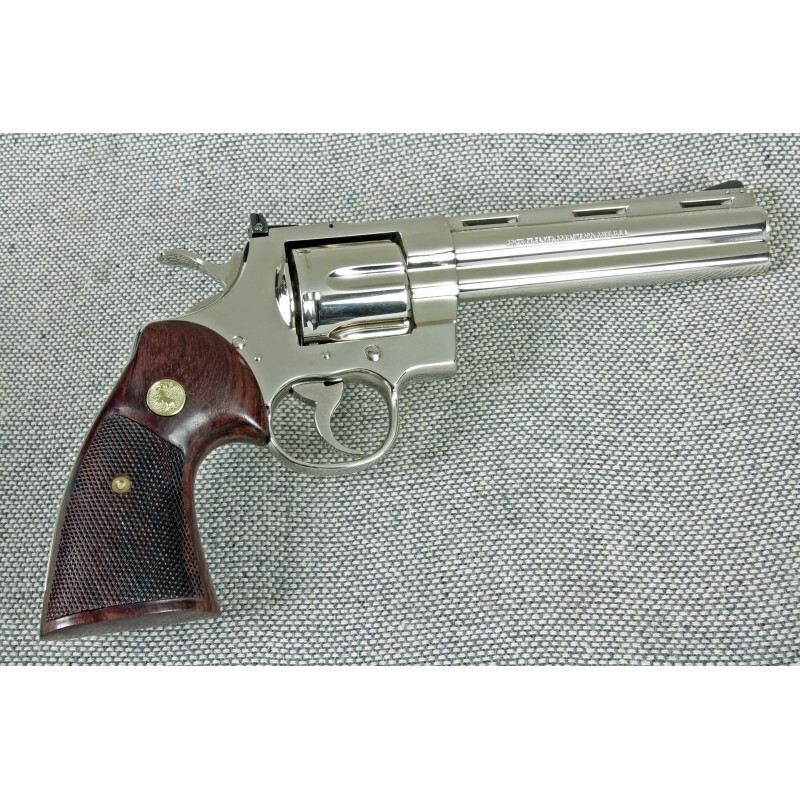 However, finding a 'fresh' set of Colt Python grips that are period correct and at a reasonable price seems to be asking too much these days. 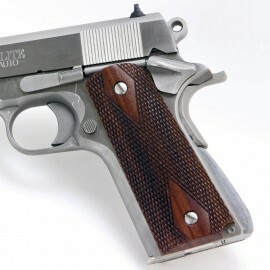 In the meantime, I ordered a set of "Third Type" from Eagle Grips and I am satisfied with the fit and finish. Be patient, though; it took 3 months for me to receive mine.